We’ve been cleaning out the freezers to make room for some incoming elk and lamb, and we found several packages of “soup bones.” They were far too meaty for the dogs, so I made a batch of stock. First I roasted them all off in a hot oven with three or four onions cut in half, and half a dozen carrots until everything was nicely carmelized. I was thrilled to discover the tail in the treasure trove as well (when it’s wrapped in butcher paper, it’s sometimes a surprise when you unwrap it). After everything browned up, I put it in my biggest stockpot, brought it to the barest of simmers, and left it overnight. Then I cooled it, skimmed off the hard beef fat that had congeled on top, and strained out the vegetables and meat (veggies went to the chickens, and the meat got stripped off the bones and added to the dog food). Now here’s where the “thanks to Michael Ruhlman” part comes in. I’ve been making stock my entire adult life. It’s why I always spent a little more for organic chickens, because I was planning to get whatever I could out of them, and over the years I’d tried a lot of methods for straining out the grungy bits — cheesecloth, strainers, coffee filters — but I never wound up with a really nice clear stock. This is where Ratio: The Simple Codes Behind the Craft of Everyday Cooking comes in. Ruhlman has a really clear description of how to make a raft with egg whites to clarify stock. Actually, he describes how to enrich stock with additional mirepoix and ground meat to make a consomme, which isn’t really what I needed to do. I just wanted a nice clear stock that I could pressure can and store in the pantry. And since eggs are plentiful around here, I separated six egg whites out following Ruhlman’s instructions, added them to the cool stock, and brought the whole thing up to a simmer. This is when the egg whites start to coagulate, and form a sort of mat across the top of the pot. Basically, they act as a filter. The stock simmered for an hour, while the egg whites filtered out all those little gritty bits. As you can imagine, not pretty, but effective. And easy! For some reason I thought making a raft was going to be difficult — but it’s not. 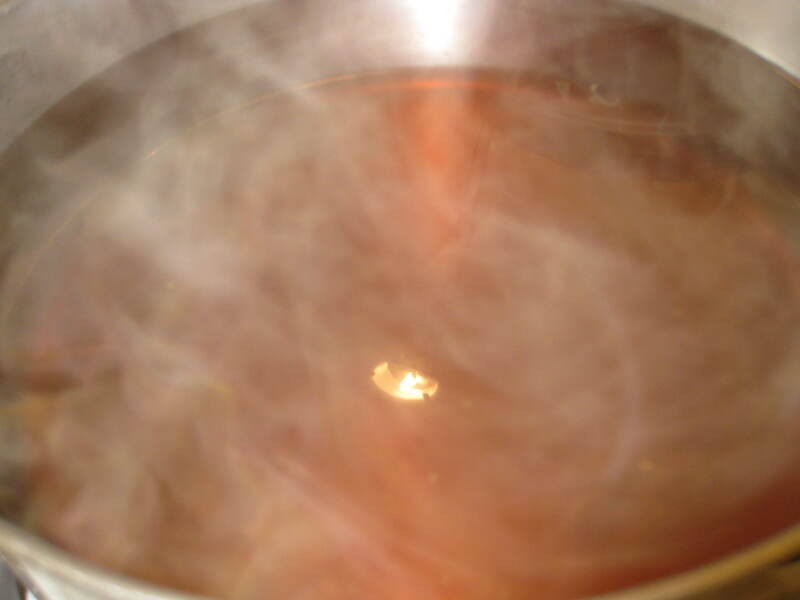 It requires some attention and stirring while the stock comes to temperature so the egg whites don’t scorch on the bottom of the pot. But aside from that, once the raft forms, you leave it at a gentle simmer, and it does it’s thing. After an hour, I removed the raft (which I fed to the chickens), and underneath was a lovely clear amber-colored stock. There was more than I wanted, so I boiled it down for about an hour until it was two-thirds in volume of what it had been. 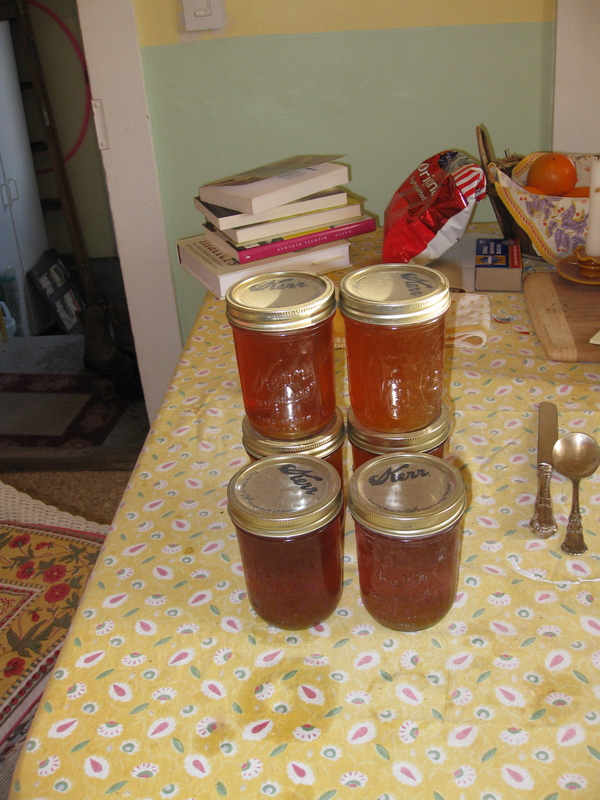 In the meantime, I got out the pressure canner, sterilized some pint jars, and prepared to can the stock. Here’s what I wound up with — six pints (well seven, but I ran out of new lids, so one pint is in the fridge) of clear, lovely beef stock, that’s shelf-stable and can go in my pantry. I also wound up with some goodies for the chickens, and for the dogs. Now, this is one of those projects that’s really easy if you work at home. Not everyone has the time, but if you do, and you have the kind of schedule that allows you to hang around the house while occasionally taking a break to perform the next step, then this is really pretty easy. The raft idea is interesting. I made stock from our holiday turkey this year. I didn’t bother removing the fat from the broth and froze it in individual pints. I made two batches from that bird and veg. I thought the bits might have one more round in them so instead of throwing them away I froze those too so I could give it a shot later. I would love to can stuff but haven’t had the guts to spend the money to get a pressure canner and try it. I’m certain that the dogs and cats would appreciate the exercise too! I am not ashamed to say that Ruhlman’s method for making stock in the oven (under 200 degrees for hours or overnight) changed my life.